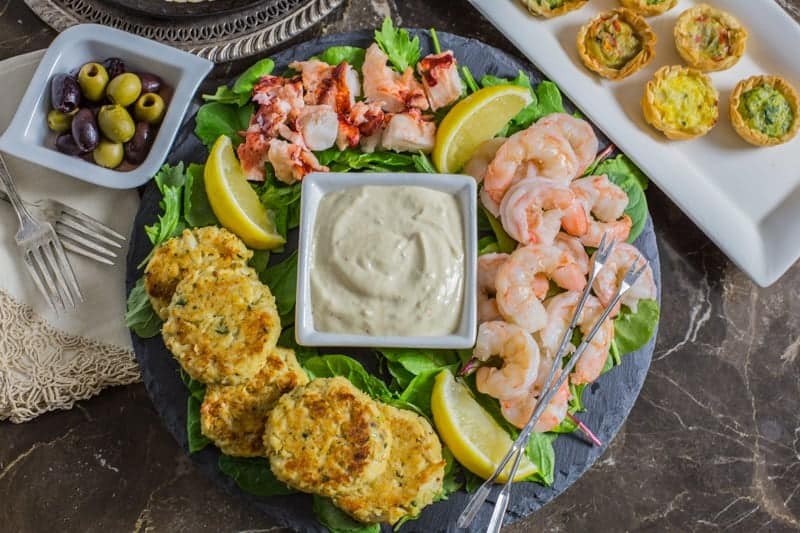 Make holiday entertaining easy and stress free with this semi homemade Seafood Appetizer Platter with Homemade Mustard Sauce recipe. An impressive and elegant appetizer spread that can be on the table in 30 minutes! Is there a more festive month than December? It’s all about celebrating the upcoming Christmas and New Year holidays, spending time with family and friends, going to parties, and hosting fabulous get-togethers at home. Even though it’s probably the “funnest” month of the year, it’s also the most stressful. I’ve got one (hyphenated) word for you to help keep your sanity while entertaining this busy holiday season. Can you say “semi-homemade”? The key to implementing a truly successful semi-homemade strategy is a focus on only high quality products and one of my favorite places to shop for those high quality products is The Fresh Market. In Florida, I used to live 5 minutes away from The Fresh Market and went there on my weekly store runs, until I had to move to New England a few years ago. Literally, I cried as I was leaving my favorite store behind, as there would be no more walking through the huge selection of amazing fresh flowers when I first entered the store or stopping by the bulk coffee bean section to grab a sample of freshly brewed coffee. The exceptional, second to none, customer service I always received in the seafood, meat, and deli departments and the unbelievably tasty treats in their bakery was something I was going to miss greatly. Luckily, I eventually moved to an area where The Fresh Market is now only 25 minutes away, so guess all that crying was for nothing. Anywho, my point is that I can always count on The French Market to provide high quality semi-homemade ingredients and, for this Seafood Appetizer Platter with Homemade Mustard Sauce, I used their delicious signature ultimate lump crab cakes, wild north Atlantic lobster tails, and wild American shrimp. I rounded out the platter with a few of my other favorites, like ready made TFM frozen appetizers, pre-cut cheese found in their deli, TFM’s water crackers (my favorite is the cracked pepper, a variety of olives from the olive bar, plus a spicy snack mix and a little dried fruit from the bulk bin section. 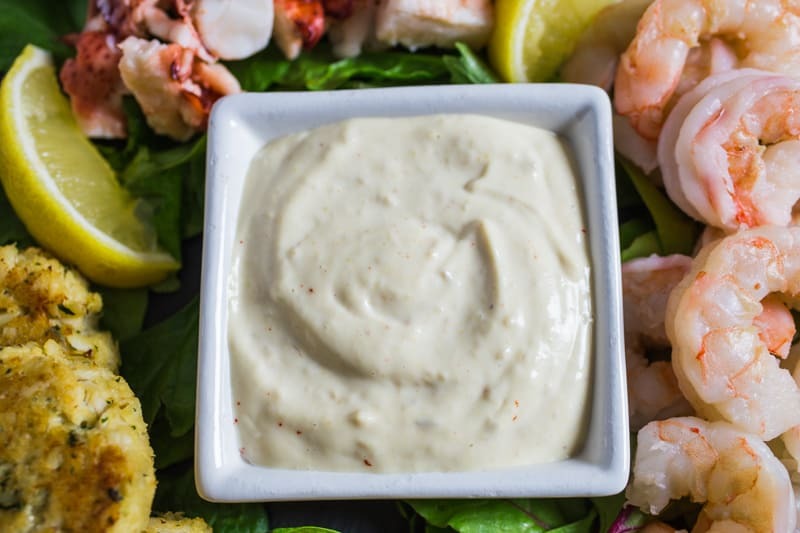 For the seafood, I quickly mixed together a delicious homemade mustard sauce, made with just a few common ingredients, and ready to eat in minutes. 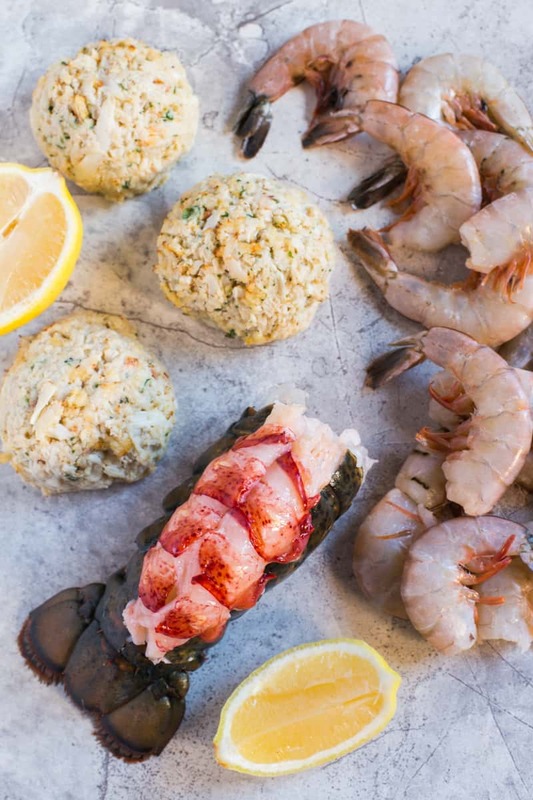 The tangy dry mustard and slight spiciness of the horseradish in the sauce pairs perfectly with the mild flavor of the crab cakes, lobster meat, and chilled cocktail shrimp. Do you have a favorite place to shop? 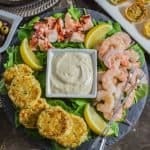 Let me know below in the comments and don’t forget to PIN this Seafood Appetizer Platter with Homemade Mustard Sauce recipe for easy entertaining! Looking for a non-seafood appetizer recipes? Try these meaty stuffed cocktail meatballs or add these Easy Spinach Feta Bites to the platter too! 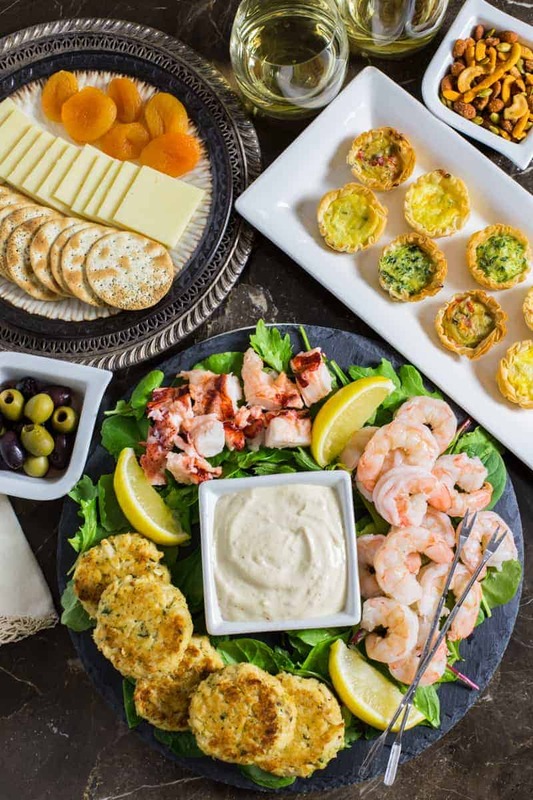 Make holiday entertaining easy and stress free with this semi homemade, impressive and elegant appetizer spread that can be on the table in 30 minutes! In a small bowl, mix all ingredients together until well combined. Cover and place in the refrigerator until ready to use. Divide each crab cakes in half and form each half into a smaller sized cake (should have 12 total). Cook accordingly to package directions. Using a large platter, put down a layer of lettuce and place a bowl of the mustard sauce in the middle. Arrange the crab cakes, shrimp, lobster, and lemon wedges on top of the lettuce and around the mustard sauce. Serve immediately and with additional accompaniments. Store leftover mustard sauce, covered, in the refrigerator for up to 1 week. I just booked a ticket – I will be arriving on Friday to stay with you guys until after New Year’s Day. You can totally greet me with this spread you have going on here and I hope we’ll go shopping for more seafood. I’m loving this appetizer, Karrie! Yes, the holiday season can be stressful! So bring on this semi-homemade seafood platter! It will make a great appetizer, full of flavors! 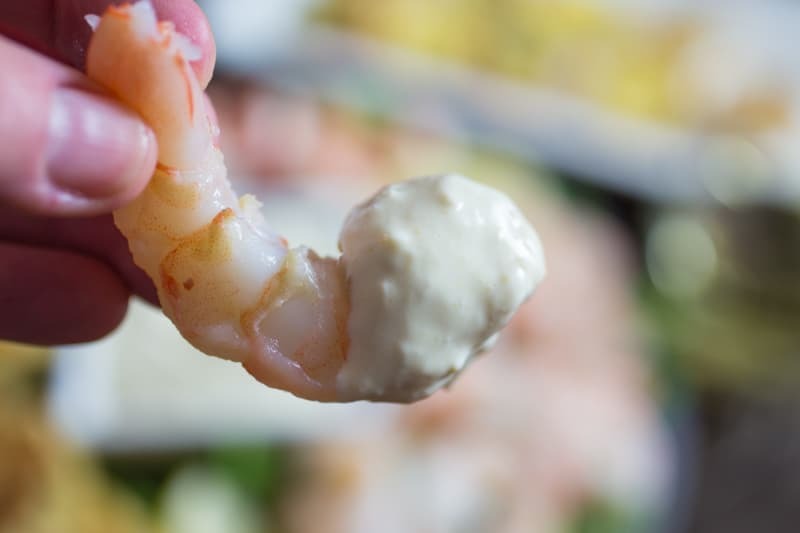 You’re lucky I don’t live close… And you did not invite me to this party of yours because YOU KNOW this seafood appetizer would be gone in negative too seconds… Once I walked through the door. I have SPIDEY-SENSES for seafood (DUH) so yeah………… About that. Hopefully, you’d know to have a back up platter in the fridge waiting for when my tornado self-left, LOL!! I want this platter served at the next party I attend so I can just hover around it all night. YUM!! I love all seafood and just looking at this is making me hungry. Semi-homemade is a wonderful thing especially when it looks this good! This seafood platter is our kind of thing around my house and it would disappear in no time! Yum! Yum! Such an awesome appetizer recipe, Karrie! My mouth is watering after seeing your post! Fortunately for you we have The Fresh Market here in Charlotte or I would be landing on your doorstep! This is such an elegant and fancy pants appetizer platter! And I think I could cannonball into that mustard sauce! Cheers, K! I totally thought I was the only one who cried after moving away from the BEST GROCERY STORE EVER! In my hometown there’s this store chain that’s like a combination of Whole Foods and Safeway. They have everything you could ever need and moving away was nothing short of painful. But I’m not here to talk about my problems. . .I’m here for this amazing app platter! Hello, semi-homemade :). This whole thing looks fantastic!